Portland thrash maniacs Toxic Holocaust gave up their latest corrosive collection Chemistry of Consciousness this fall, and will bring those blasts to the masses early next year on a global tour with Exhumed. News of the tour arrived today (December 11), with a press release laying out the two outfits' plans to wreck it onstage in North America and Europe. Following a few late 2013 concerts Exhumed have lined up with upcoming split-release buddies Iron Reagan, the California gore-grinders will hook up with Toxic Holocaust for a bunch of U.S. shows in January. 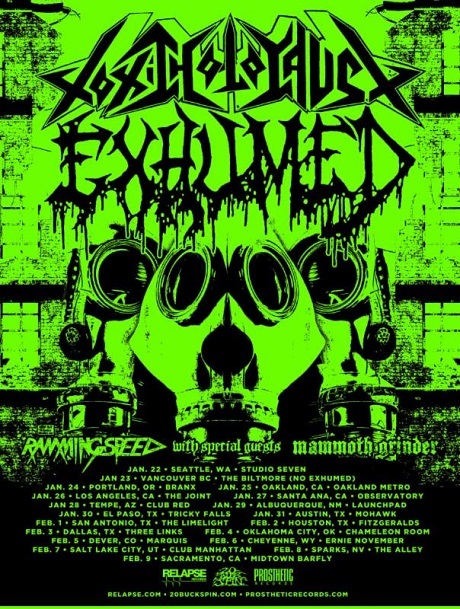 Also joining the acts will be Boston d-beat appreciators Ramming Speed and Austin's Mammoth Grinder, though it turns out Exhumed will skip out on the lone Canadian show stop at Vancouver's Biltmore Cabaret on January 23. After the North American trek, Toxic Holocaust and Exhumed hop on a plane to Europe for a number of shows. You'll see the itinerary down below. While Toxic Holocaust will be touring behind Chemistry of Consciousness, Exhumed will be promoting both their 2013 Necrocracy LP and the upcoming split LP with Iron Reagan, which is due January 14 via Tankcrimes.